This year saw two ships come back after sixty years to revive a long-standing route that had first been opened 132 years earlier – that between Tampa, Key West and Havana. The 1,600-berth Empress of the Seas and 2,052-berth Carnival Paradise succeed to a route that had been operated by uniquely one predecessor for more than seventy years. 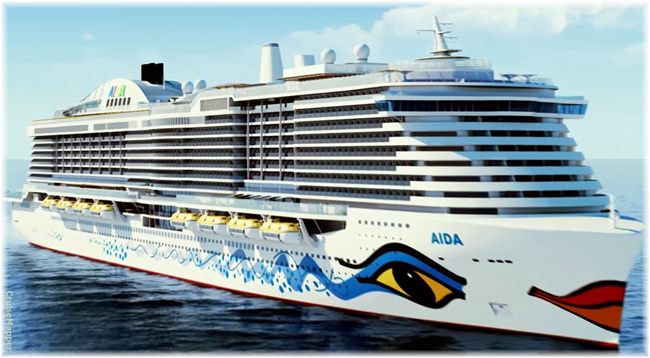 Meanwhile, last week in Hamburg saw the virtual keel-laying for AIDA Cruises’ 183,000-ton 5,200-berth AIDANova. And on the other side of the Atlantic, Hurricane Irma has led to the cancellation of seventeen cruises from Florida ports. The assignment this year of Royal Caribbean International’s Empress of the Seas and Carnival Cruise Line’s Carnival Paradise to cruises from Tampa to Havana not only opens another page of history but also reminds us of this trade as it was 130 years ago. In 1885, Florida developer and railway builder Henry Plant began a new steamship service between Tampa, where he had recently built a new deepwater port, Key West and Havana. Two ships were built to operate this service, the 884-ton Mascotte, in 1885, and the larger 1,611-ton Olivette, in 1887, and in 1888 rail lines were extended from Tampa onto the piers of the new dock system. Probably the route’s most famous passenger, Winston Churchill, who was a 20-year-old correspondent at the time, travelled overnight from Tampa to Havana in the Olivette on November 19, 1895. By this time, Cuba was known for its cigars and Tampa, due to its regular connections with Havana, for its cigar-making using Cuban leaf. With the arrival of the three-month long Spanish American War in 1898, Tampa became the principal port of embarkation for US operations in Cuba and two of Plant’s Tampa hotels were taken over for use by the US generals. In 1899, the Plant and Flagler shipping interests in Florida consolidated into the Peninsular & Occidental Steamship Company (the “American” P&O), which also included Henry Flagler’s Miami-Nassau route. For the winter of 1910, P&O chartered a much newer and larger steamer for the Havana route. 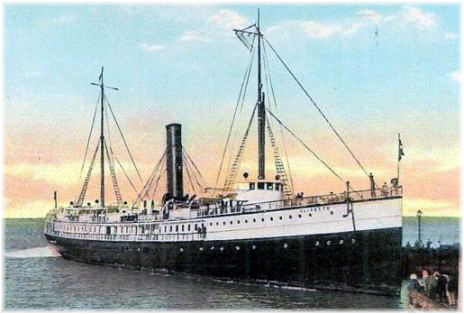 This was the Eastern Steamship Company’s 3,500-ton Governor Cobb (named for a governor of Maine), the first US merchant ship to be powered by steam turbines. The Governor Cobb operated between the end of rail at Knight’s Key, Key West and Havana and was joined by the Plant Line’s 3,342-ton Canadian-based Halifax, which spent her summers sailing between Boston and Halifax. In January 1912, the railway was extended over the keys to Key West and the Governor Cobb and Halifax began running on a direct Key West to Havana route. For a time between 1917 and 1920 the usual Miami-Nassau ship, the 1,741-ton Miami, ran between Tampa, Key West and Havana, as well as assisting at other times of the year when she was not needed for the winter Nassau trade. The Governor Cobb had proven such a good ship that in 1920 P&O purchased her from Eastern Steamship for the Havana service. Business was so good that it also ordered a new ship, the 2,472-ton 420-berth Cuba, for the Tampa-Key West-Havana route. The ultimate Havana ship followed in 1931, when the 4,923-ton 742-berth Florida was delivered. 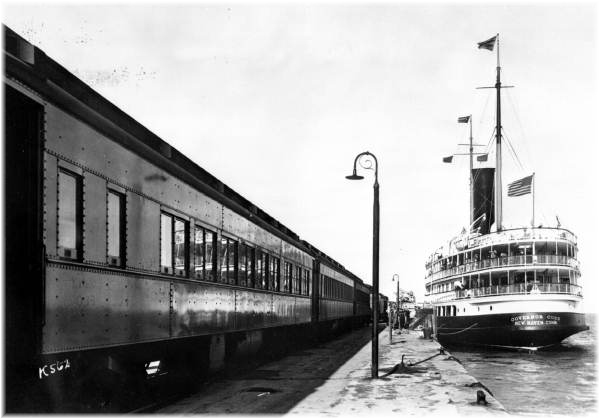 She only served the Tampa-Havana route for a few years, however, as the Labor Day hurricane of 1935 washed out the railway to Key West and P&O had to move the Florida to Miami, where there were also rail connections from the north. This left just the Cuba on the Tampa-Key West-Havana route. After the Second World War the Cuba was sold to Italian owner Ignazio Messina & Co and renamed Pace to run between Genoa and Haifa. In 1954, she was succeeded by a new 4,302-ton Cuba, which had been built as the Red D Line’s Caracas in 1927. Entering service on the Tampa-Key West-Havana route in January 1955, the new Cuba failed to revive the old route and that same year was transferred to Liberian flag and renamed Southern Cross. Her new role was as a cruise ship, running 12-night cruises from Miami to La Guaira, Santa Marta, Aruba and Curacao. P&O, meanwhile, in a reaction to the situation in Cuba, switched the Florida to the Miami-Nassau route in 1957. For a number of years after the war, the West India Fruit & Steamship Company also ran a car ferry service on the 90-mile route between Key West and Havana, but with no overnight sailings. The last ferry left Havana for Key West at 3 pm on October 31, 1960. While the Tampa-Key West-Havana route was not revived until this year, J C Carras’s Classic International Cruises ran the 400-berth Daphne on an experimental cruise from New Orleans to Havana in May 1977. Her sister ship Danae and Black Sea Shipping Company’s 500-berth Kazakhstan and 460-berth Odessa also ran a few cruises from New Orleans that called at Havana during the Carter regime. But other than these few trial voyages, there was no connection between the US and Cuba from 1960 until the Adonia arrived in Havana on May 2, 2016. Now, after an absence of sixty years, 2017 finds two ships back on the original Tampa-Key West-Havana run. The 1,600-berth Empress of the Seas leaves Tampa on alternating 4- and 5-night itineraries that include all three original Plant Line ports – Tampa, Key West and Miami. 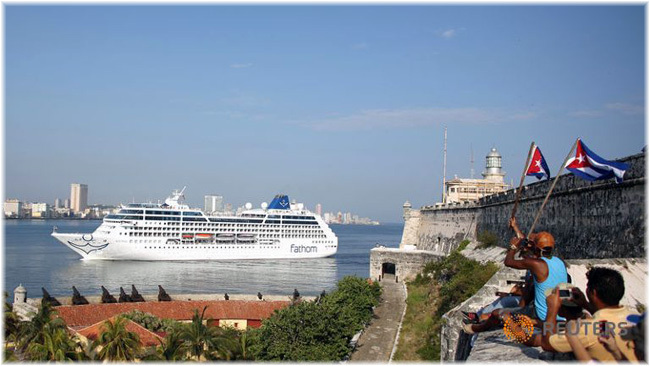 Some sailings feature an overnight stay at Havana, while others also include a call in Mexico. Ironically, just as the Mascotte was the first ship to be built for 3- and 4-night round voyages on the Tampa-Key West-Havana route in 1885, so the Empress of the Seas was also built specifically for the 3- and 4-night trade in 1990, although in her case between Miami and the Bahamas. She nows alternates between 4- and 5-night cruises. 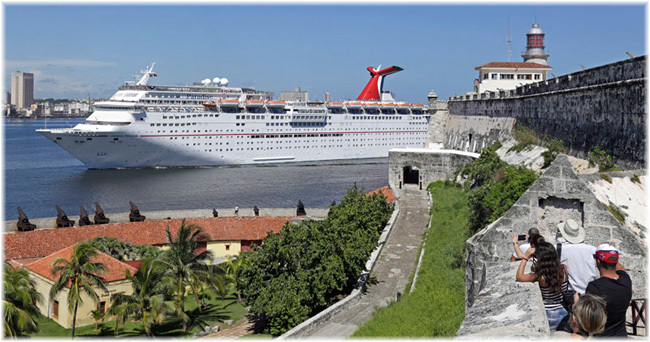 The 2,052-berth Carnival Paradise, also based at Tampa, now serves Havana as well, but only on selected sailings out of her usual 4- and 5-night itinerares. On the other hand, all Empress of the Seas cruises call at Havana. The Carnival Paradise has effectively replaced the 710-berth Adonia, which Carnival Corp & plc used to re-open cruise service to Havana, in her case from Miami under its Fathom brand. The new sailings by Carnival Paradise, however, have marked a return to the original Havana staging port of Tampa. 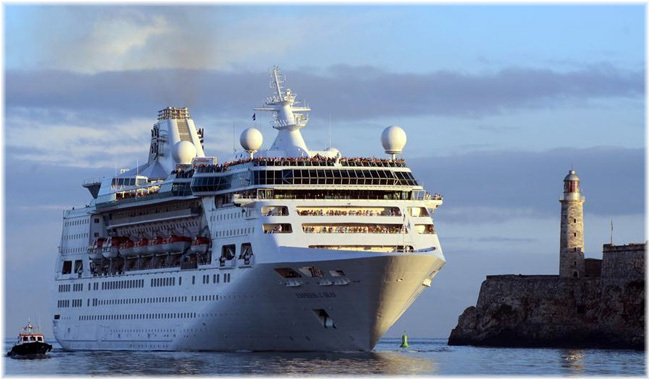 In the meantime, Norwegian Cruise Line serves Havana from Miami, where its 2,002-berth Norwegian Sky has been employed for several years running 3- and 4-night cruises to the Bahamas. Delegates to Seatrade Europe in Hamburg last Wednesday were invited to witness a virtual keel laying ceremony for AIDA Cruises’ AIDAnova, the world’s first fully LNG-powered cruise ship. The vessel is one of seven such ships on order for AIDA’s parent company Carnival Corp & plc. Donald, together with Bernard Meyer, ceo of Meyer Yards, Michael Thamm, ceo of Costa Group and Carnival Asia, and representatives of three of the Carnival Corporation brands that will receive the LNG ships – David Dingle, chairman of Carnival UK, Neil Palomba, president of Costa Cruises, and Felix Eichhorn, president of AIDA Cruises – gave the official signal for the keel laying of the first ship of the new LNG generation, AIDAnova, which will be delivered by Meyer Werft Papenburg in the autumn of 2018. The new ships are being built two each for AIDA Cruises, Carnival Cruise Line and Costa Cruises, with the seventh being built for P&O Cruises in the UK. Following the introduction of AIDAnova in 2018, Costa Cruises will take delivery of the next LNG-powered ship 2019. The first steel cutting ceremony for this ship is scheduled to take place at the Meyer Turku shipyard this week. LNG-powered ships for Carnival Cruise Line and P&O Cruises will follow in 2020. Costa Cruises and AIDA Cruises will each receive an additional LNG-powered ship in 2021, followed by another LNG-powered ship for Carnival Cruise Line in 2022. Full refunds have been offered in all cases, plus future cruise credits of 25% or 50%, depending on which cruise line. The exception is the September 7 sailing of the Carnival Paradise, which left Tampa for Key West and Havana on time and is not offering refunds for no shows. This has raised somewhat of a controversy as originally intending passengers objected to sailing “out into a hurricane” while another Carnival sailing on the same day from Port Canaveral by the 2,974-berth Carnival Liberty was cancelled. 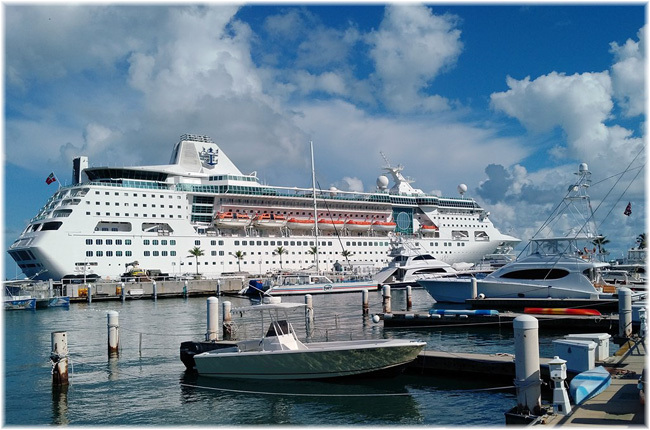 Several other itineraries have either had their departure dates delayed by the cruise lines or port rotations modified in order to avoid the worst of the weather. Meanwhile, several of the temporarily unemployed cruise ships, now seeking shelter at sea, are being and will be used for hurricane relief with suplied of food, water and ice and to evacuate those displaced by the hurricane in places such as St Maarten and St Thomas to safety. Many of the usual 7-night cruise ships are elsewhere right now on summer duties, either in Europe or in Alaska. 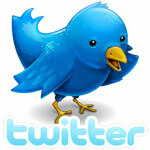 This includes the likes of Celebrity Cruises, Holland America Line and Princess Cruises. But of those cruise ships operating from Florida at this time of year, many are on a two-cruise-a-week combination of shorter 2-, 3-, 4- and 5-night cruises.